We, the Christian community of Saint Barbara Parish, are united in our solid Catholic Faith and Tradition. We strive to live out our baptismal call through service to our members and God's people. Through support and education, we shall nurture spiritual growth, at all ages, while promoting a strong foundation for our values and beliefs. Joyfully, we go forth, through the working of the Holy Spirit, to carry out the mission of Jesus Christ. If you or someone you know is interested in becoming Catholic or learning more about the Catholic Faith, please call the parish office at (330) 833-6898, and ask to speak with our Director of Religious Education, Mollie Luginski, for information about our RCIA sessions, which will begin in the Fall. PSR, for children entering grades Kindergarten through 8th grade, begins on Sunday, September 9th, 2018 with the Mandatory Parent Meeting and Open House at 9AM in the school. 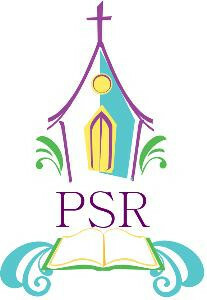 The Registration fee for PSR is $30/child but no more than $65 for three or more children. Registration Forms have been sent through the mail, but they are also available at the entrances of the church. Contact Mollie Luginski in the Parish Office for more details or to register your child. Please help us in better meeting the needs of our parish community. You may do so by devoting a few minutes of your time toward filling-out our online survey. You may access the survey via the following hyperlink: Saint Barbara Parent Survey. We appreciate your assistance and we hope to continue to serve you even better in the future! 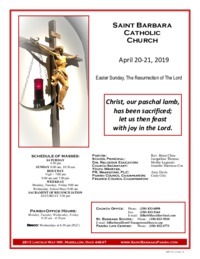 Please turn-in your completed Registration Form along with your payment in the form of a check or cash to Mollie Luginski in the rectory by no later than Monday, June 10th, 2019 at 12PM. Make checks payable to: St. Barbara Parish.